In this spectacular image, observations using infrared light and X-ray light see through the obscuring dust and reveal the intense activity near the galactic core of the Milky Way. The image combines pictures from the Hubble Space Telescope, Spitzer Space Telescope and Chandra X-ray Observatory. 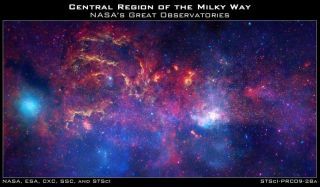 A giant composite image of the Milky Way's center has beentaken by NASA's three Great Observatories ? the Hubble and Spitzer SpaceTelescopes and the Chandra X-ray Observatory. The image, unveiled by NASA today, was made to celebrate theInternationalYear of Astronomy, 400 years after Galileo first turned his telescope tothe heavens. The pictures of our galaxy's hub combines a near-infraredview from the HubbleSpace Telescope, an infrared view from the Spitzer Space Telescope, and anX-ray view from the Chandra X-ray Observatory into one multiwavelength picture. Experts from all three observatories carefully assembled thefinal image from large mosaic photo surveys taken by each telescope. Thiscomposite image provides one of the most detailed views ever of our galaxy?s mysteriouscore. More than 150 planetariums, museums, nature centers,libraries, and schools across the country have received a giant 6-foot-by-3-footprint of the stunning image. Participating institutions also will display a matched trioof Hubble, Spitzer, and Chandra images of the Milky Way?s center on a secondlarge panel measuring 3 feet by 4 feet. The composite image features the spectacle of stellarevolution: from vibrant regionsof star birth, to young hot stars, to old cool stars, to seething remnantsof stellar death called black holes. This activity occurs against a fierybackdrop in the crowded, hostile environment of the galaxy?s core, the centerof which is dominated by a supermassive black hole nearly four million timesmore massive than our Sun. Permeating the region is a diffuse blue haze of X-ray lightfrom gas that has been heated to millions of degrees by outflows from thesupermassive black hole as well as by winds from massive stars and by stellarexplosions. Infrared light reveals more than a hundred thousand starsalong with glowing dust clouds that create complex structures including compactglobules, long filaments, and finger-like "pillars of creation,"where newborn stars are just beginning to break out of their dark, dustycocoons.